My family is home for the Christmas break and I haven't found the time to sit at the computer long enough to write a review, so I'm going to go ahead and take my annual break to enjoy their presence. 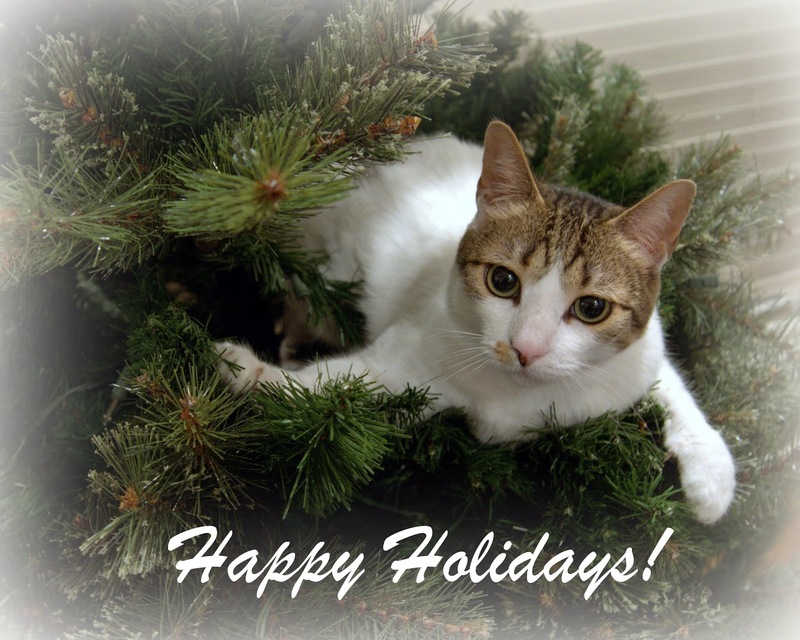 I wish the happiest of holiday seasons to you! I'll keep this brief, today. Believe it or not, we're just now getting around to decorating our Christmas tree! The Autobiography of Eleanor Roosevelt - Wasn't in a mood for nonfiction, this week, so it sat on the nightstand. This was a big movie and TV weekend because Kiddo is home for Christmas break (he likes to enforce "Family Movie Nights") and I like watching movies while doing things that involve sitting, like gift-wrapping. Kiddo intended to rent The Hobbit but accidentally rented the second Hobbit movie, The Desolation of Smaug. I don't think it hurt all that much to watch them out of order. I did think it was a little bit of a problem that I read The Hobbit so recently. It was fresh enough in my memory to make the book-to-movie changes obvious. A little distance from the reading might have helped. But, I enjoyed it, even though I thought it was a bit melodramatic and didn't always like the changes they made. The Desolation of Smaug was our family movie but I ended up watching most of it by myself. 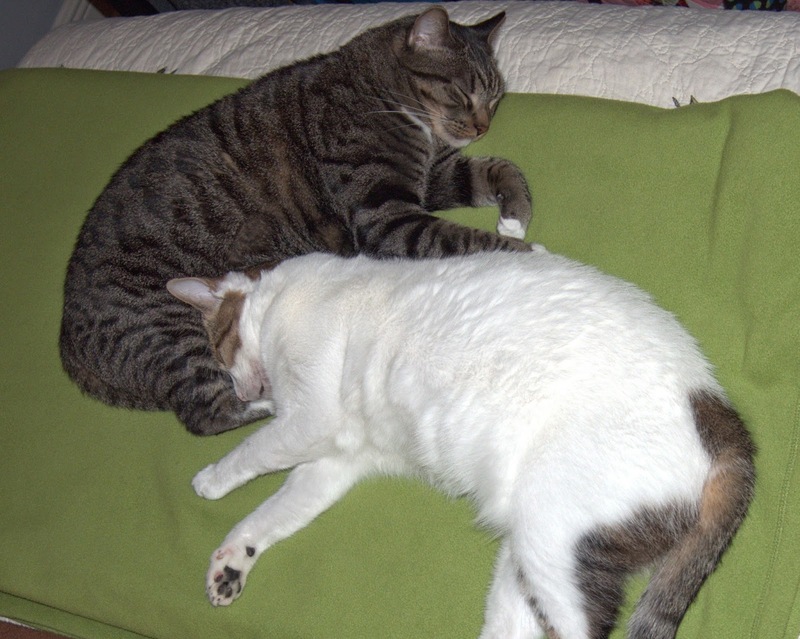 One guy fell asleep and the other drifted off because it was getting late. We also watched a couple episodes of The Librarians, we think. We don't have the channel that airs the series on Sundays. But, it appeared to be the beginning of the series (as opposed to either of the older movies with Noah Wyle). Loved the blend of adventure, humor, and paranormal elements.. A magical library! Such fun. Unfortunately, I have no idea if the channel we viewed it on will ever show episodes again or if it was a one-time deal. The Librarians was something Husband and I watched alone; the final two movies were to entertain me while I worked on the tree and wrapping. We have an artificial tree that has to be "fluffed up" to make it look realistic after being crammed into a box all year, so I plugged in Stardust to keep me company while I did the fluffing and began wrapping gifts. And then, later last night, we watched Hot Fuzz while I finished the wrapping. Husband absolutely abhors violence so he wasn't too fond of the bloody bits but fortunately it was funny enough that he sat through the entire movie. I haven't seen Stardust in quite some time. It's a wonderful story. Hot Fuzz is great fun but there were moments I would have happily skipped. I'll watch a movie I know contains violence, unlike Huzzybuns, but I tend to look away during the yucky parts if I know what's coming. Overall, I had a pretty terrific reading and blogging week. It'll be interesting to see if I can keep up that kind of pace, this week. I'd really like to finish up the year completely caught up on reviews but, of course, Christmas is coming and there's much to be done. To those who will be starting their celebrations tomorrow, Happy Hanukkah! 'Twas the night before Christmas aboard the Black Sark. 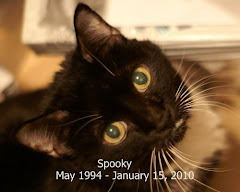 In hopes that Sir Peggedy soon would be thar. While visions of treasure chests danced in thar heads. Stood watch in the crow's nest for ships in the fog. As up went his sleigh an' then down to the sea. Merry Christmas, me buckos, an' a Happy New Yaargghhhhhhh! What a hoot! The paperback is a mere $6.95. I reviewed A Pirate's 12 Days of Christmas by the same author and illustrator in 2012 and loved it. Unfortunately, my husband took it to work and gave it away to a friend with small children, without bothering to ask if it was one I wanted to give away. Arrrrgh, matey. 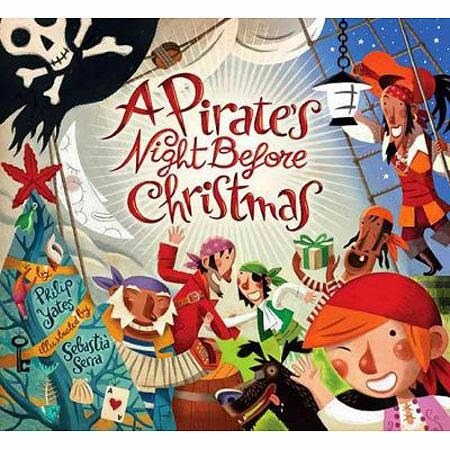 Reading A Pirate's Night Before Christmas makes me want to rush right out to buy its companion. I highly recommend both. 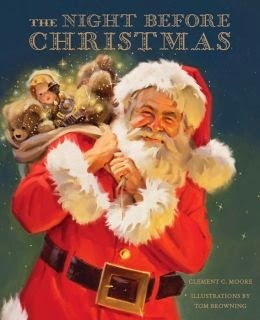 The Night Before Christmas by Clement C. Moore has been published so many times that the only direct way you can find this specific edition, illustrated by Tom Browning, is to look it up by its ISBN number: 978-1-4549-1355-9. Originally entitled "A Visit from St. Nicholas," it's easy enough to find a copy of the classic poem in book form. Of course, not every version is equal in beauty. My childhood copy is the most detailed and beautiful version I've ever seen; but, Tom Browning has apparently made a living painting Santa Claus and if all of the illustrations were full-page like the one on the cover, this version would be comparable to my all-time favorite. Some of the illustrations look like medallions. You can see an example from the back cover of The Night Before Christmas at Amazon. I'm not an Amazon Associate so clicking on that link won't benefit me. Regardless of the fact that not all of the illustrations are full-page and I'm pretty certain that the text is not entirely accurate to the original poem (although the changes are very minor), the Tom Browning version is beautiful and at $6.95 it's an excellent value. I gave it 4 stars and will be sending my copy to my granddaughter. Recommended. I received a copy of The Night Before Christmas from Sterling Children's Books for review. This is what happens when Huzzybuns leaves town. I put a soft, folded blanket on the bed and invite the kitties. Naturally, they're quite happy to hang out with me. I'm sure I've already told the story of how I came to acquire my copy of The Hollow Man. I've noticed I repeat myself a lot on this blog (not deliberately). 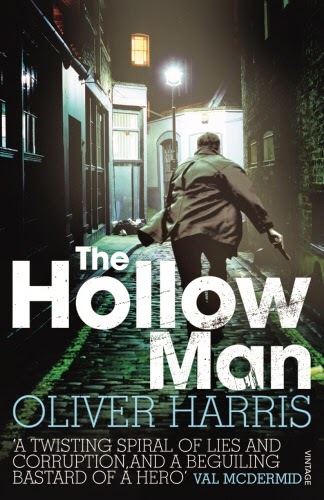 The Hollow Man is the first book in the Nick Belsey series by Oliver Harris. In The Hollow Man Nick, a London detective, has stolen a car from another police station (not the one in which he works) and crashed it, so he's in deep trouble and about to lose his job when he is sent to investigate an apparent suicide. The dead man, Alexei Devereaux, was incredibly wealthy and Nick decides he must figure out how to steal Devereaux's money so he can escape the country. But, something doesn't feel quite right about the suicide and the further he digs into Devereaux's life, the more tangled the web Nick finds. I think one of the things I adore about the Nick Belsey series is that the stories are delightfully complex. I doubt I'll ever manage to guess what really happened before Nick has unravelled the mystery in one of these books. I also am quite fond of Nick. He's not just a little flawed; he's a mess -- clever and fascinating and horrid. Fortunately, he tends to get caught when he does something illegal, which doubles the fun. "How is Nick going to get out of this pickle?" is a question that keeps popping up. I particularly loved the ending of The Hollow Man. If you like a London setting, the Nick Belsey series is loads of fun for the way Nick dashes around all over the city. I think when I reread them and read the third book (which the author told me he was close to finishing, a few weeks ago), I'll keep a London map or the A-Z handy. Highly recommended, especially to people who enjoy a complex mystery, an unusual and complicated character and/or a London setting. I've just been paging through my list of books read in 2014 and was a little shocked to find I've forgotten to review quite a few books during the latter part of the year. And, now that I'm looking back, I'd like to have some sort of record of those I skipped for other reasons, as well. So, I'm going to do some 1-paragraph reviews for record-keeping. Most of these were from my personal collection. I've noted the exceptions. 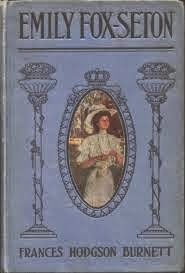 The Making of a Marchioness (or Emily Fox Seton), parts 1 and 2 by Frances Hodgson Burnett - I wrote a bit about reading The Making of a Marchioness and watching the TV movie, The Making of a Lady (page down) but never wrote a review. Perhaps because I watched the TV movie first, I was disappointed at the lack of tension in The Making of a Marchioness but I did enjoy the protagonist. Emily Fox-Seton is a hard-working woman who escapes her hand-to-mouth life when the Marquis of Walderhurst asks her to marry him; but, his family objects and when he leaves for India, Emily is placed in terrible danger. Logopolis by Christopher H. Bidmead - Logopolis is one of the older Dr. Who books from my husband's collection and near as I can tell the dialogue is almost if not completely word-for-word the same as the script of the 4-part series. This particular set of episodes is among my old favorites from the Tom Baker years so the book caught my eye when I was in the midst of what turned out to be my first slump of the year. I loved it. Reading the book transported me to an earlier time when my husband and I watched Dr. Who in his dorm room every Saturday night. 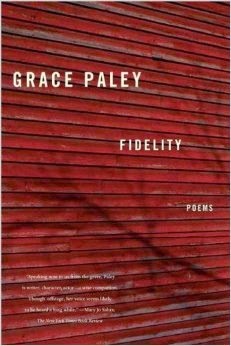 Fidelity (poems) by Grace Paley - I've written about Fidelity before, as it was a reread so I guess I figured I shouldn't bother, this time. However, I think it's worth mentioning that I felt as if I had an entirely different experience, the second time. That's one of the wonderful things you take away from the reading of poetry. I'm sure I'll reread Fidelity many times. Fact or Fib and Fact or Fib 2 by Kathy Furgang - Oh, eck, this is a big oops. 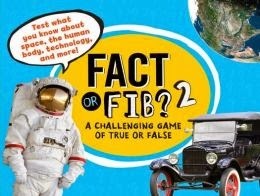 I read Fact or Fib and Fact or Fib 2 the moment they arrived. They're quiz books in which three bits of information appear on a 2-page spread and then you must determine which are facts and which one is fiction. The answers are on the next spread. They'd make for fun game time on road trips. My only complaint was that there was some cross-over between the two books. These two books were sent to me by Sterling Children's Books. 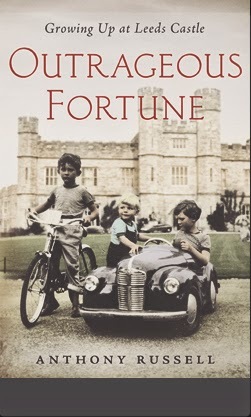 Outrageous Fortune: Growing Up at Leeds Castle by Anthony Russell - The memoir of a British fellow who grew up filthy rich, spending much of his childhood with the grandmother who owned Leeds Castle, I found Outrageous Fortune very readable but ultimately unsatisfying. While the subtitle indicates that it's about his childhood, the author was vague about many aspects of his life that were mentioned. The reader knows, for example, that he ended up in the United States but there's not even a paragraph or page explaining how or why that occurred. A little bit of material about how his childhood impacted the author's life in later years would have gone a long way toward making the book feel more complete. Hmm, not bad for the first 6 months of the year. The latter half of the year has been much worse, when it comes to reviews skipped for personal reasons or put off and then forgotten. I'll have to reread quite a few of the children's books I neglected. The Life-Changing Magic of Tidying Up by Marie Kondo is a book I bought after reading Bybee's review. 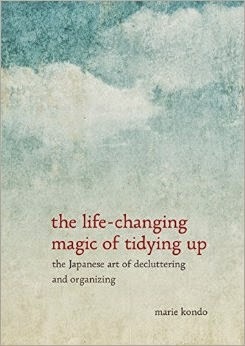 I love this quirky little book about how to do a massive decluttering job and keep your home tidy. The author is Japanese so there are influences from her culture but it still applies well to my American home. The key concept is that you must get rid of everything that doesn't give you a "spark of joy" when you pick it up in your hands. If you keep only the things you love, you'll be happier. She advises going through items by type, rather than going from room to room or keeping only things you've used in the last two years -- two of the most common organizing methods. I have some minor problems with her method. She says when you go through your clothing (clothing is first on the list of things to tackle) you should pull out absolutely every piece of clothing you own and touch each item to see if it gives you that spark of joy. If not, toss it or donate it. The problem is that even though we recently moved to a larger house, space is still at a premium and the sheer quantity of possessions we've amassed is just too much. I can do chunks but I can't do everything at once -- especially when it comes to books. Fortunately, the concept is already helping. Although I may not be able to go through absolutely everything as a category at once because I've been that bad, the "spark of joy" is a concept that works for me. I doubt you'll ever hear me tell a piece of clothing thank you for the joy it gave me, but those eccentric touches to her style made the book doubly entertaining. I don't have a photo of this week's book arrivals, so you get a cat. I knew you'd approve. Once again, not a big blogging week. I just haven't been feeling it, lately. Husband said -- during a moment in which I wondered aloud if I should even bother at all -- "Why stop? If you just write when you feel like it, you've got a reading journal." Husbands can be surprisingly helpful. The Autobiography of Eleanor Roosevelt - Update on this one: I've been reading it off and on for at least a couple weeks. It's wonderful. Although a lot of the names were probably familiar to people when she wrote it and are not familiar to me (the wealthy, politically positioned and famous), I don't bother worrying about who's who. I just enjoy the anecdotes and the view from inside politics in a different time period. It's a fascinating read but it will take me some time to finish. Big Little Lies by Liane Moriarty - Recommended by Michele of A Reader's Respite and purchased in e-book form (shock!!!) when it went on sale at a price I thought I could swallow (I still don't feel right spending more than a few dollars for an electronic book). Loving this one, so far. Michele gives excellent recommendations. None. And, not much in the way of TV, either. We drove up to Memphis to look for a new pan at the Williams-Sonoma outlet store (all our old non-stick pans are losing their surfaces) and then stopped for a couple hours at Kiddo's to take him out for an early birthday dinner and give him some gifts on Saturday. On Sunday we spent the day cleaning/purging. That book I finished on tidying (mentioned above)? Seriously helpful. I wrote about it on Goodreads the moment I finished and will repeat that review, here, tomorrow. Fiona Friday - Book love. I get that. All three of these are from my personal library. I did Daniel Wallace backwards. First, I read The Kings and Queens of Roam and fall madly in love with Wallace's writing. Then, a little over a year later, I dipped into Big Fish. I still have not seen the movie and you probably all know what the book is about, but just in case . . . here's the Wikipedia entry about Big Fish. What I loved about Big Fish was the fantasy elements. 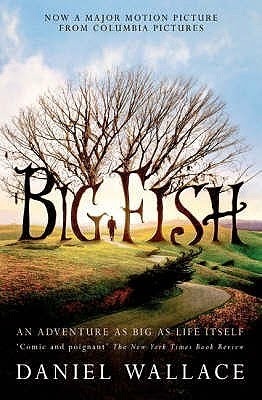 In The Kings and Queens of Roam, it was magical realism while Big Fish implies that William is telling a big fish story, exaggerating the accomplishments and character of his father. The protagonist, William Bloom, wants to believe his father is a hero, bigger than life, close to perfect in character and beyond human in kindness and ability. But, since his father is dying and in awareness that your end is near, truth often comes to light, there are also some hard truths to face. I was less than thrilled with the fact that there was a character dying of cancer; books with cancer patients have been difficult for me to read since my mother's death. But, the over-the-top aspect of the book made it tolerable. Definitely a book I'd recommend but with a warning to those who have trouble reading books with a dying character. It's not focused on the dying, but it's still uncomfortable, at times. 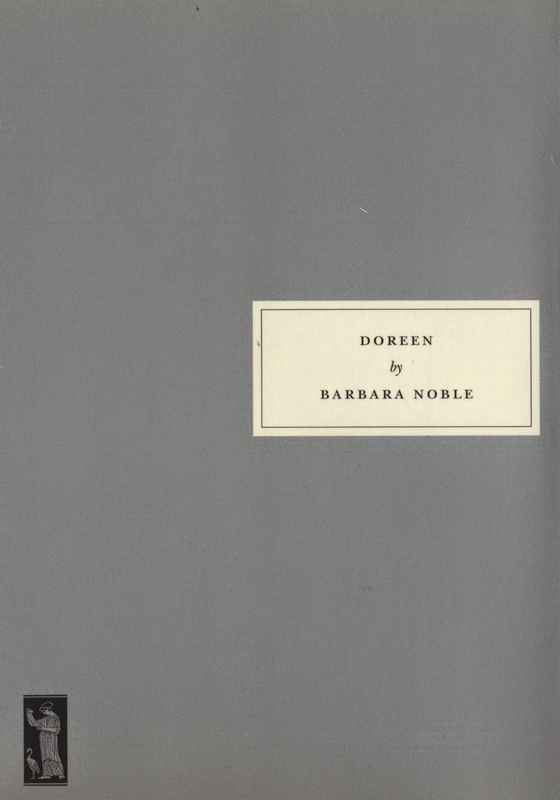 Doreen by Barbara Noble is a Persephone book that I bought a couple years ago specifically because it was set during WWII in England. Doreen is about a little girl named Doreen who is evacuated to the country after her mother, Mrs. Rawlings, decides it's too dangerous keeping Doreen in London with the nightly raids. Early in the war, Mrs. Rawlings kept Doreen home because she couldn't bear to part with her child but after sleeping in a shelter night after night, Mrs. R. mentions her concern to a woman who works in the office she cleans, Helen. Helen has a brother in the country. Geoffrey and his wife Francie are childless, although not for want of trying. They're happy to take Doreen in and Doreen finds that she loves the country, Geoffrey makes her laugh, and since Francie is very involved in the community, Doreen gets to know all the local children and quite a few of the adult villagers. Geoffrey and Francie are quite well off. Things happen and eventually Mrs. Rawlings must decide whether or not being in the country and the damage it could do to Doreen (getting used to a posh life, having trouble adjusting upon her return) outweighs the threat of the bombs at her at home in London. I loved Doreen and highly recommend it. You get a good sense for the fear they must have felt during the Blitz, but it's also a fascinating look at social status and how awkward it must have been on both sides to send young ones to the country. Highly recommended, especially to those who love reading about WWII. 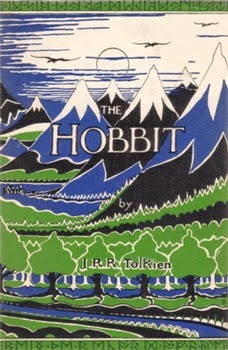 The Hobbit by J. R. R. Tolkien is the book I chose to take with me on vacation. I've never -- repeat, never -- managed to keep myself from taking several paper books along on a journey, regardless of how far I've gone. I know, crazy. I own a reader but I'm just not a big fan. However, I was having a terribly slumpy reading month so it seemed like a good time to try just taking a single book along with my reader on the assumption that I could undoubtedly find something to read if I finished The Hobbit (I do have a couple hundred e-books, after all) and if I failed, I always buy books in England. So, no problem. For those of you who are as far behind in life as I am, The Hobbit is about a little humanoid creature named Bilbo Baggins who lives a happy life in his Hobbit hole, enjoys entertaining and loves his garden. He's not one to go on adventures, although he has some adventurous ancestry in his blood. When a wizard and a dozen dwarves show up for tea and insist that he accompany them on an adventure because he has needed skills, Bilbo Baggins resists. But, then his adventurous blood takes over and he goes on a grand adventure that involves over a year of travel by various means, fighting off diverse enemies such as gnomes, trolls and giant wolves, and helping his friends when they go to war. There was one small but plot-critical thing I disliked about The Hobbit. However, in general, I loved the story and can't wait to move on to the Lord of the Rings series. No, I really haven't read those, yet. Nor have I seen any of the movies. Recommended, particularly to fantasy lovers and those who enjoy classic literature. I appreciated the older writing style. 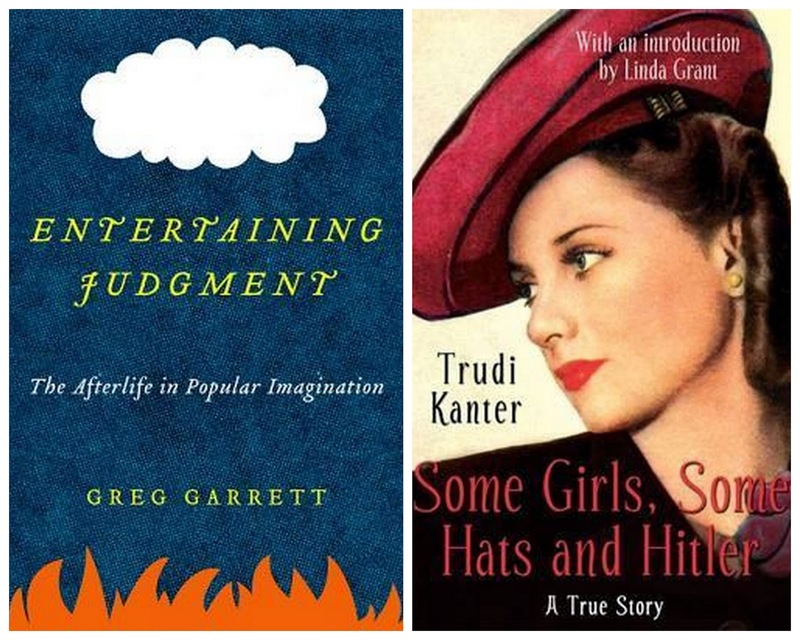 hitRECord TV books to accompany Season 1 of HitRecord TV by J. Gordon Levitt, et al. We watched Howl's Moving Castle, Bill and Ted's Excellent Adventure, and The Edge of Tomorrow. Well, I say "we" but husband managed to sneak out at the beginning of The Edge of Tomorrow (also apparently known as "Live, Die, Repeat") so it was just me and Kiddo. Husband absolutely hates violence. That was all over the long holiday weekend. It was just the three of us at home for Thanksgiving, a very quiet, low-key holiday. Apart from the two gripping Nick Belsey books by Oliver Harris, The Hobbit, the sweet romance The Evergreen Bride by Pam Hillman, and Heart in the Right Place, I pretty much consider November a wash. During much of November I didn't even feel like reading so I just grabbed whatever was nearby or extremely light. It's not that I didn't enjoy the other books so much as that they felt like pleasant fillers. "Whatever was near" translated to 4 e-books. Shocking! I've found, though, that I finally am figuring out what works best for me in e-book form and that is whatever I don't feel obligated to mark. Romances, light reading like cat stories, a memoir. There were a few things I highlighted in Heart in the Right Place (a memoir), but I never go back to highlighted passages in e-books because it's too much of a pain. So, that's the main reason I usually avoid them. I like to liberally plaster my books with flags or Post-its and flip back to reread quotes, find references to other books worth looking up, etc. It's nice to know there are times I don't feel like I have to do that. But, I fear I'll never be a regular e-reader. I must have my books. I need to mark up, flip back, reread. 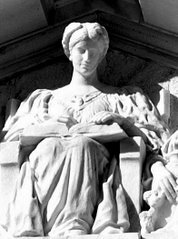 It's the lack of ability to easily do that which experts are latching onto as problematic for youngsters; they don't get as much out of the reading because they can't flip back easily to reread bits that they may have not understood at first or which make more sense after the reading of a later passage. Makes sense to me. Anyway, not much of a reading month. I'm happy to move on to December, although I'd like to know where the hell this year has gone so fast.